When it comes to fire, there have been a lot of various uses over time since its first discovery in ancient times. Back before temperature control, it was used to warm homes. It has also been used to cook food to be safe for humans to eat. Now, there are almost endless things that can be done with fire, including installing an outdoor fire pit for recreational purposes. Here is some more information about how you can use fire to enhance your entertainment. There are many options for sprucing up your lawn. For instance, you can add a concrete walkway. It’s both practical and attractive. There are a variety of ways you can implement this design feature into your overall home design. 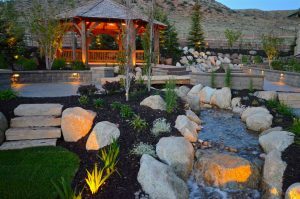 When considering these beautiful pathways, it’s a good idea to become familiar with the style options before hiring a professional landscaping company. Curb appeal is important to any home. When it comes to the aesthetics of your residence, the focus is usually on the home’s exterior or the landscaping. If you have a concrete driveway, it’s just as important as those features. Like any household element, it requires upkeep and maintenance. There are a few tips that can keep it looking good for years to come. While a winter wonderland is beautiful to look at, having to deal with the downsides of the snowy season is everything else but great. One of these aspects is snow plowing. While it is something that needs to be done, there are many reasons to hire professionals to take care of this hefty task for you. There are many different types of foundations to choose from for your new home construction. Concrete foundations are one of the most popular choices for residential buildings and commercial buildings alike. These foundations come with many great advantages. Uneven terrain on your property may be charming, but it sure is annoying if you want to install a patio or such. That’s where a retaining wall comes in, a versatile structure that holds or retains soil and water. Retaining walls are smartly engineered systems because they have to fight with gravity on a daily basis. Population growth and expansion are inevitable, no matter where you turn. In many cases, that means the destruction of surrounding vegetation and trees. Unfortunately, the need for fresher air, a cooler environment and preventing soil erosion take a back seat to this development. But successful vegetation management, to include flail mowing, can go hand-in-hand with urban expansion. The next time you’re thinking of doing or re-doing your driveway, walkway, retaining wall, patio or backyard play area, consider the versatility of poured concrete. One of the most durable and inexpensive building materials available, concrete has gotten a bad rap in the design arena. Typically, when people think of creating a beautiful space, they leave concrete out of the equation. Au contraire!